Born and raised in Scotland Debbie left to study in London. Six years later after a holiday in Cornwall she moved to Penzance (1996) as it provided an idyllic environment in which to bring up her family. 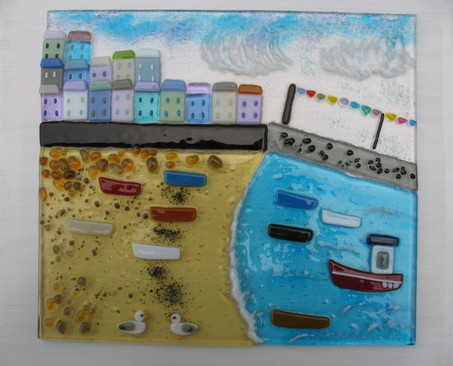 In fulfilling her desire to live by the sea, Debbie believes her artwork conveys her love of Cornwall, with its calm pace of life and beautiful scenery. Inspired by her long walks through the coastal villages and the reflection of light on the sea, Debbie translates these images by using bold colour and simple shapes to express the unique tranquility of Cornish life. Debbie's work is represented by several galleries throughout the UK. "I am mainly influenced by British beaches and coastlines, our colourful beach-huts, cottages, windbreaks and bunting. Scotland also remains close to my heart so my frequent visits to family will also play a part in my work. I create pictures that make me happy and hope they evoke a positive feeling in others, either as a memento of a special place, or simply as a colourful picture to escape a grey day."